Online Snowboarding Magazine for the Snowboard Community – to help you learn to snowboard safely and have FUN! The goal of our Snowboard Websites is to Support and Speed Your Evolution as a Snowboarder. I wrote about my first experience wakeboarding on this site SnowboardSecrets.com, and you can read my article about my first time wakeboarding here. I heard from a writer and wakeboard teacher named Jacky Miller, and she has written a comprehensive article on learning to wakeboard, which I am sharing. Read Jacky Miller’s article on learning to wakeboard here. Jacky Miller is a mom of four who loves to take her family on outdoors trips. 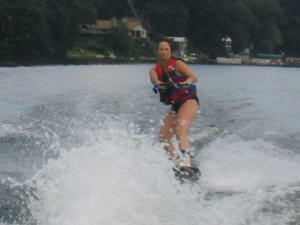 She is an experienced wakeboard instructor and spent much of the past twenty years perfecting her techniques. In her free time she also writes regularly for major websites including Jen Reviews, Forbes, The Huffington Post and Fast Company. Thanks for getting in touch Jacky! Booty Guard Tailbone Protectors Here!! Snowboard Boot Fitting Advice Here – Helped! Bookmark this site and check back. New Stuff added often!